When she taught students at Prospect Hill Academy charter high school to create apps, Caroline Meeks used the Compass to help along the way. Students wrote down what was on their minds at the start of class and set this aside. As an introduction to the Compass, the student reverse-engineered something in the room together—they chose a pen. Who were the people this was designed for? What observations, principles, ideas, and experiments might the designer have had that led to this design? 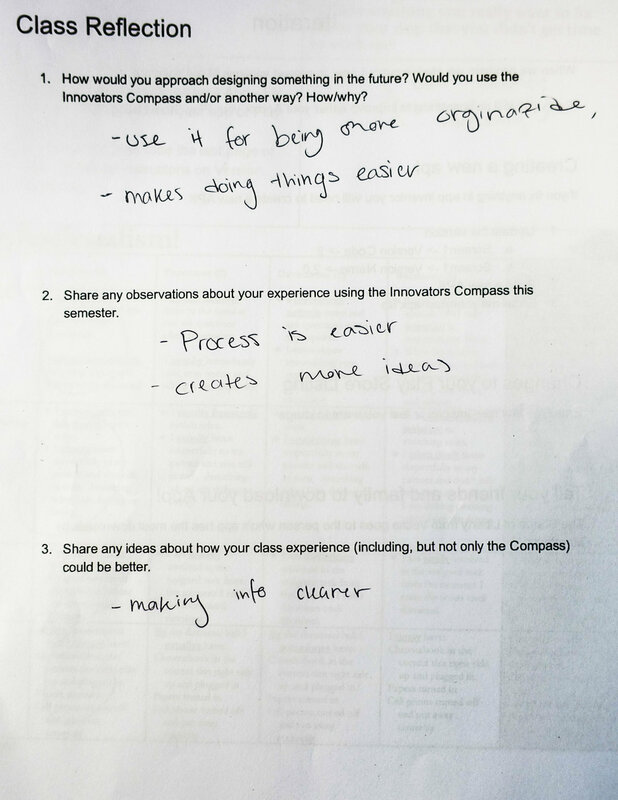 (3) Using the Compass on what was on their minds—half the class worked on a test coming up in another course. Other topics included how to make more money to personal relationships. 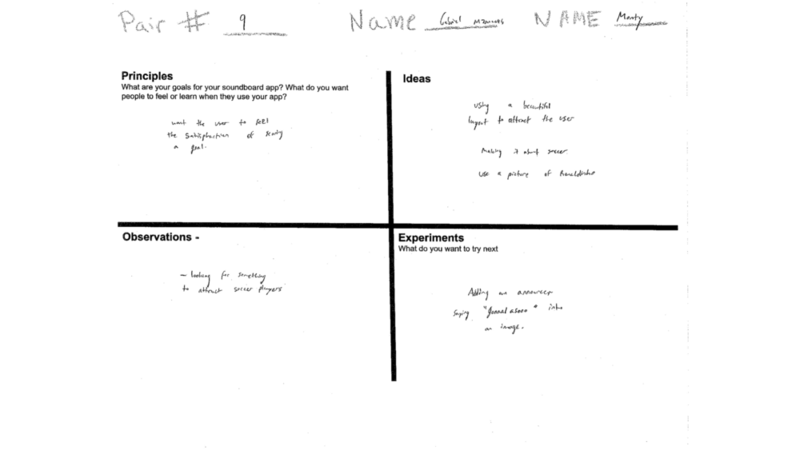 (4) Brief follow-up on their experiment at teh start of the next class. Students looked at existing apps. They considered who these were designed for. They made observations about things they liked and didn't about the apps, and pulled out design principles for themselves. Lastly the captured any ideas that these apps inspired for them. Caroline projected this slide as instruction—introducing one of the apps they'd look at for inspiration. 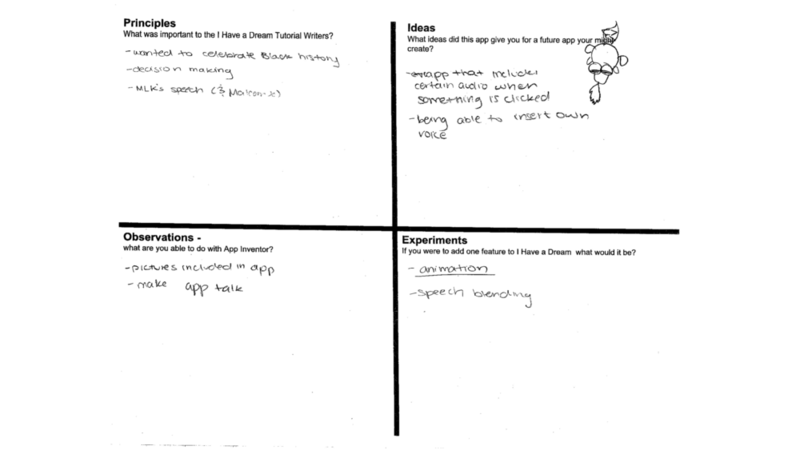 Here's one student's compass from the "I Have a Dream" app. In the first year of her course, we weren't using the center of the compass yet. 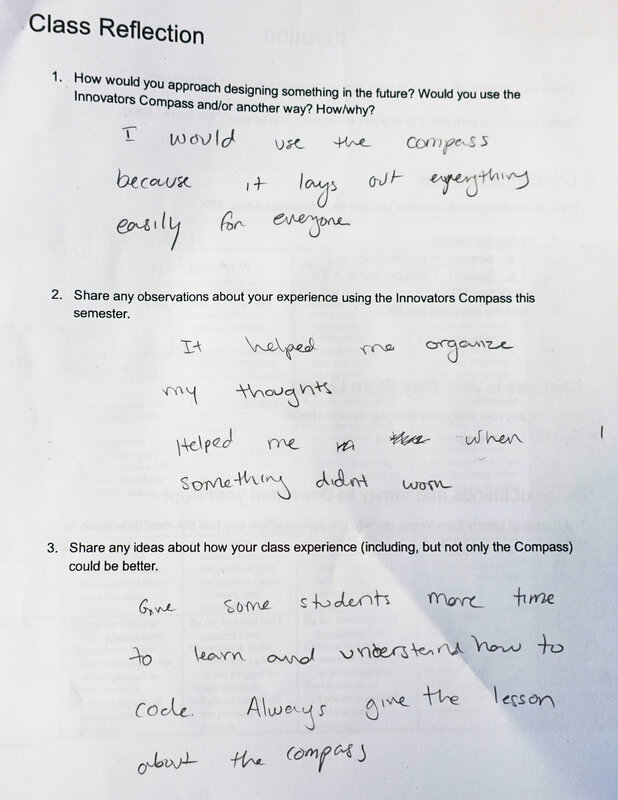 The compass offered students a quick way to focus their app design work before diving into wireframes or actual programming. Caroline had them start in different places on different days or projects. This compass started with Principles and went clockwise. This one started with Observations—about where they were as a team—and went clockwise. The students got to try some of their prototype games out on "users" and used the Compass to make the most of that opportunity. They captured just "observations" and "ideas" as they watched and listened to the little kids playing their prototype games. At the next class period, they developed new ideas further. 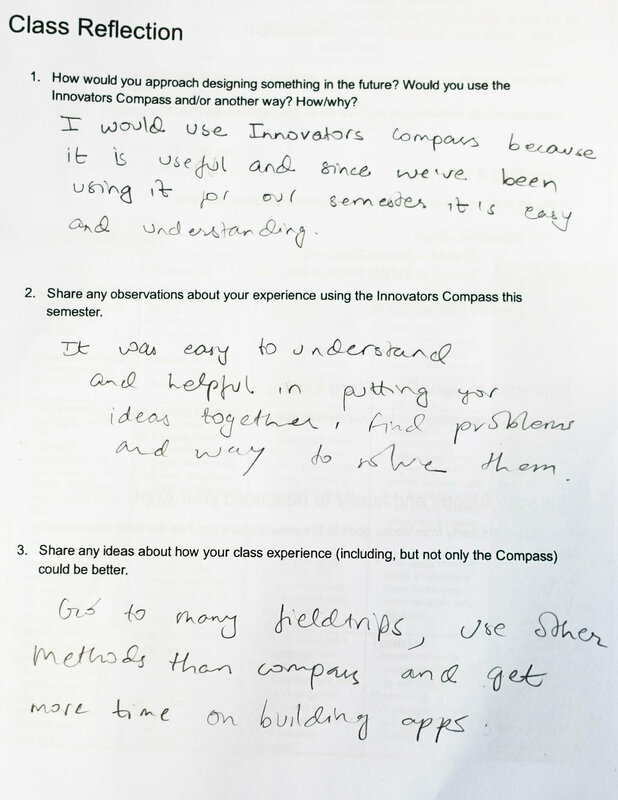 Caroline solicited their "observations" and "ideas" about the course as well, including the use of the Compass. Here are a few interesting ones..
All these outcomes are great, because students got how to design. We're as glad to see them also seeking additional tools and putting the Compass in their own words, as saying they'd use the Compass in the future.